Whenever I buy potatoes, I almost always cook them the same way. I usually pick up red skin potatoes, cut them into yummy little quarters, throw them in my big red bowl, and douse them in some olive oil. I mix in smoked paprika and rosemary, occasionally dill, and lay them all out on a cookie sheet to bake at 375 degrees for twenty minutes. Then I pull them out, and flip them (by hand- usually burning my finger tips) so the other side can roast for 15-20 minutes. 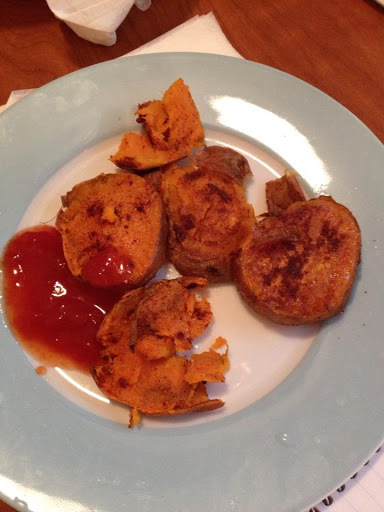 This time, I had three medium sized sweet potatoes and wanted to do something different. I boiled the three sweet potatoes in a big stockpot for about twenty minutes, and then drained in my colander. I don’t think I boiled them long enough, since they were still a little hard on the inside. Then I flipped them, and hit the other side with a little olive oil and spices, and baked for another 20 minutes on the top rack of the oven this time. They came out amazing. They were crispy on the outsides like a French fry, and soft on the inside like mashed potatoes. They are a perfect complex carb to go alongside some chicken for dinner. Too bad Scott ate them all so quickly I didn’t even get to have them as leftovers the next day!